In the heart of London, enjoy the Christmassy hustle and bustle while taking part in a cocktail making masterclass followed by a festive meal. 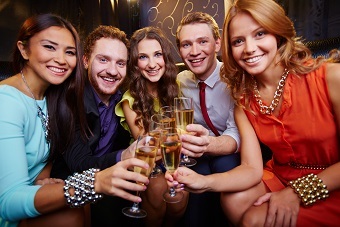 London Chrtistmas party ideas are the perfect way to treat your team to an end of year celebration that’s totally unique and will last the whole night in stylish, popular venues. London cocktail making and meal is the ideal choice for a Christmas party with a difference, and combines a fun evening with a chance for your team to make new friendships and get to know one another! This experience includes a fun and light hearted cocktail making and meal lets you try your hand at making your favourites, from Cosmo’s to Mojito’s you choose what cocktails you want to mix, shake and of course drink during the evening. On arrival, each person will receive a complimentary welcome drink before being shown to your reserved seating for the session. You’ll be introduced to your personal bartender for the group, who will go through a quick demo and teach you some tips and tricks of the trade. Then it’s your turn to create some delicious drinks, using all of the bar equipment while being guided by the bartender. Throughout the class you’ll have the chance to taste test some example drinks and learn how to balance flavours to make the perfect cocktails. Everyone will have time to make 2-3 cocktails each, which can be enjoyed in your reserved seating. If you fancy something non-alcoholic, there’s also the choice of making mocktails with the same tasty flavours. When you’ve finished mixing your drinks, you’ll be led to your table for your 2 course meal in the evening. All of the food will have been pre-ordered by you to avoid any hassle on the night and keep your festive celebration stress free. The meal consists of a main course and a dessert each, with a menu full of classic dishes as well as some vegetarian options to suit everyone’s taste buds. The whole experience lasts around 2-3 hours, giving you plenty of time to relax and celebrate the years’ work and more importantly – Christmas! This London Cocktail Making and Meal Christmas Party is even better without the stress of organising it, so if you want any more information about this activity or simply want the whole thing organised for you, give our events planners a call on 0161 341 0052.